Many patients come to me with sensitivity to cold and touch at the gum line. This is extremely common, and strikes patients from their teenage years on up. There could be several reasons for this such as decay or a broken filling, or gum disease, but I want to focus in on one of the more common reasons: ABFRACTIONS. Abfractions are characterized by little notches appearing where the gums meet the teeth, usually on the cheek side of the tooth. They can appear singly, in rows of a few teeth, or on random teeth. The above photograph shows three teeth in a row, where the middle one is slight, the right one is moderate, and the left one is large. The severity does not always correlate to the amount of discomfort. I commonly see older abfractions with no sensitivity and newer smaller ones that are very sensitive. This is due to the fact that the nerve inside the tooth can produce new tooth structure called dentin and recede away from the sensitive area. This will only happen if the diet is adequate. I will address this topic later. If the nerve is able to shrink away faster than the tooth structure is lost, the sensitivity will diminish, even though the lesion is growing. So how do these things get there in the first place? There are a few reasons. In the past we used to blame heavy brushing as the primary cause. This seems not to be the case. The more likely culprit is grinding, clenching, and gum chewing: otherwise known as parafuncional habits. The theory states that the enamel is not designed to compress and stretch as the teeth mash into each other continually, causing microscopic chipping by the gum. I would agree that the abrasives in some toothpastes coupled with vigorous brushing could make the lesions worse. Bad bites can often be the cause. The correct term for a bad bite is malocclusion. When teeth don't fit together, the forces placed on the teeth may be extreme, causing flexion and tension. The result can be an abfraction. Other issues can be wear, headaches, jaw pain, achey teeth and TMJ issues. Orthodontists can align teeth through a variety of techniques to correct malocclusion. Braces are not just for cosmetics, in fact most often orthodontics is done to establish normal functioning of the teeth and jaws. Another factor is acidity. The modern diet can cause a very acidic environment in the mouth. This is due to the increased consumption of juices, sodas, sports drinks, and other beverages such as wine and coffee. The increase in processed carbohydrates in our diets has also resulted in more acidity due to its ability to overfeed the germs in our mouth, which produce acids as a waste product. Regardless of where the acid is coming from, it will dissolve the minerals in our teeth. 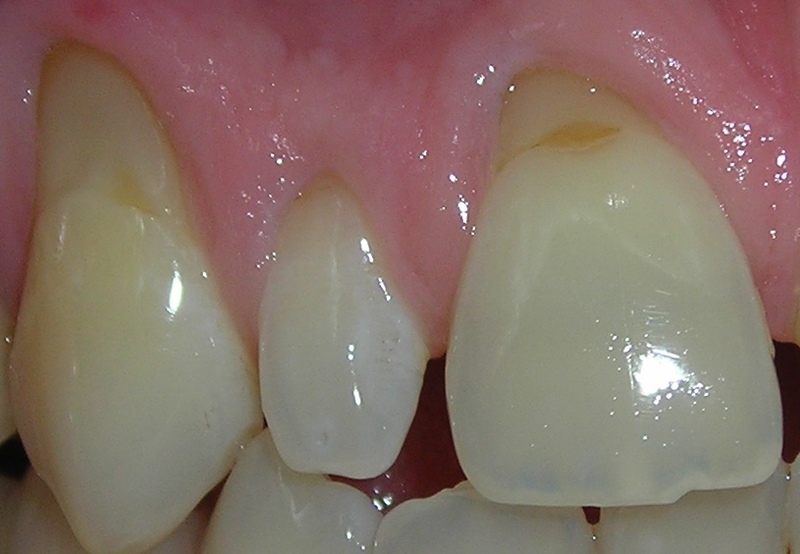 The area by the gum is especially vulnerable to this acid attack, as that is where the much harder enamel ends, and the much softer cementum and dentin begin. The acid will erode away the cementum and dentin on the root way before the enamel. This leaves the enamel unsupported, so it can flake off in small increments, until you are left with a defect and sensitivity. There is one more way that mouths can become acidic, and that is by having a dry mouth. This can occur with stress, age, medication, and a condition known as xerostomia. I don't suggest stopping your medication if you have dry mouth, please consult your doctor if you feel you have experienced a drier mouth since taking a new medication. If you just can't deal with the discomfort, then your dentist can do several thing in a pinch to help you. Varnishes and even bonding can be placed over the lost tooth structure to restore the lost enamel and eliminate the pain. Anti-inflammatory medications can be given short term as well. If the cause is determined to be a bad bite, the bite can be adjusted. It my take a period of several days before any real relief is seen once the bite has been adjusted. Appliances can be fabricated by your dentist that will prevent the damaging effects of clenching and grinding. This is sort of like giving you a helmet because you can't stop banging your head against the wall, so in most cases, this kind of treatment should not be the first choice. Trying to stop your parafunctional behaviors is very effective. Dialing in the proper amount of sleep and minimizing stress are very critical to giving up clenching and grinding. I have an article on how to do this here. Orthodontic movement is a great way to treat abfractions as properly aligned teeth don't place the kind of forces that cause abfractions . 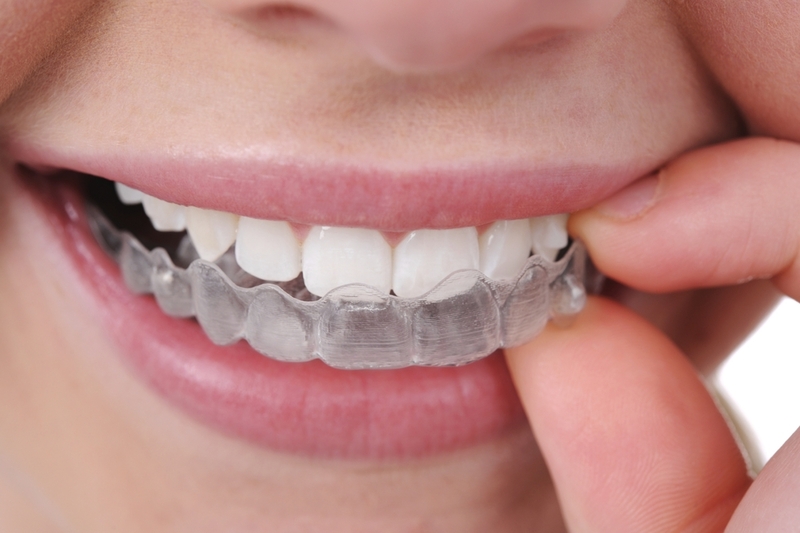 People no longer have to worry about showing braces, as Invisalign has gained popularity in recent years. Simply put, Invisalign is done using removable clear appliances. No one will even know you are doing it! So many medications can cause dry mouth, it would be impossible to list them all here. I have stated that stopping your medication without consulting your physician is a bad idea. Talk to your doctor about alternative treatments. If you just can't switch your medication, or if you just have dry mouth, then xylitol is a great option. Xylitol is a natural sweetener that raises the PH of the mouth and lowers the acidity. It also has the benefit of increasing salivary flow, which will lower the acidity on its own. I like spry mints, but many companies make xylitol based products. one or two mints sixish times a day will do the trick. Don't use xylitol based gum as gum chewing will make the abfractions worse! My article called Diet And Dental Disease talks about all of the dietary changes that you can implement to make sure your mouth is non-acidic, and capable of remineralizing your teeth. Yes, teeth can remineralize after an acidic meal, if you eat right! But once an abfraction becomes apparent, it will not fix itself. Your nerve can generate new tooth structure internal to the lesion and the pain can go away. See your dentist if your teeth hurt! I hoped this article helped. If you have any questions or comments, feel free to leave a comment or contact me.